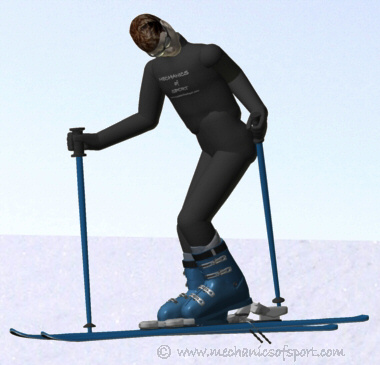 Make sure you are in a steady position, and will not slide anywhere (generally with the skis across the slope). Take a ski pole and push down on the heel lever on the back of the binding, while taking your weight off of the heel of the boot. The heel cup with then rotate upwards releasing the heel of the ski boot, so you can take your boot out. Then just repeat the same again with the other ski. Taking your weight off of the heel of the boot is very important, or you will not be able to release the boot. It does not matter so much which ski you take off first, although it is generally easier to take off the uphill ski then the downhill ski if on a slope. On to the Carrying Skis section.